Java-Buddy: Update JavaFX BarChart in background thread, to display /proc/meminfo. Update JavaFX BarChart in background thread, to display /proc/meminfo. Similar to previous post "Display /proc/meminfo on JavaFX PieChart", this example show how to display memory usage, retrieved from /proc/meminfo, on JavaFX BarChart. Another main point of this post is to show the different of loading data in various stage. There are three position in the code to load barchart data. At position A: call prepareMemInfo() to load barchart data in JavaFX Application Thread, before UI show. 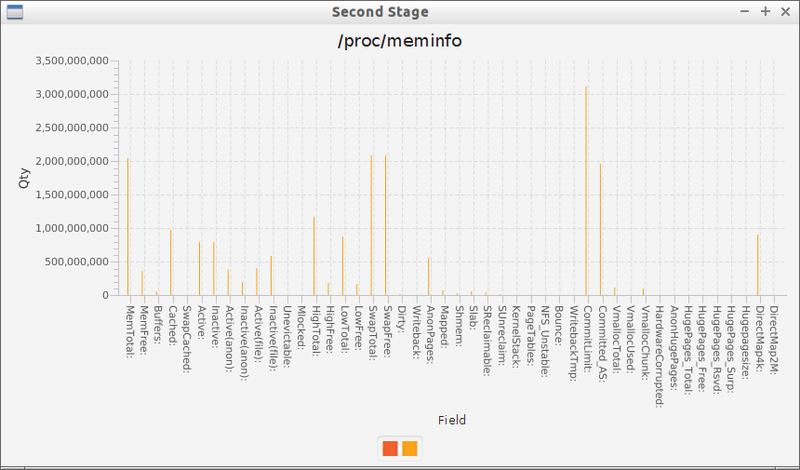 At position B, call prepareMemInfo() to load barchart data in JavaFX Application Thread, after UI show. At position C, start another thread to load barchart data. In this case, another question rised: in prepareMemInfo(), the file /proc/meminfo is parsed in sequency, but add data to series2 in Application Thread by calling Platform.runLater(). May be it will not in the same sequency. <- I'm not sure here. //Set position of second window, related to primary window. you can re-post my blog posts, with link to the original posts.